What to do when you are invited to a dinner party with foodie friends and you’re charged with making dessert? Especially when you spend far more time contemplating the savory side of a menu than the sweet side. This was my challenge one recent Friday evening. And I wanted to bring my A game. While it seems almost everyone loves chocolate for dessert, I lean towards something with fruit. And this got me thinking about a memorable sweet treat I had tried recently… a passion fruit filled chocolate. The tropical tang of the passion fruit is so unique and one of my all time favorites. Combine it with dark chocolate and it’s a match made in heaven. After a little thought, I decided to make a Chocolate Passion Fruit Tart. And while it’s been several years since I’ve made a tart for dessert, they’re not that difficult and they’re stunning when topped with colorful fresh fruit. 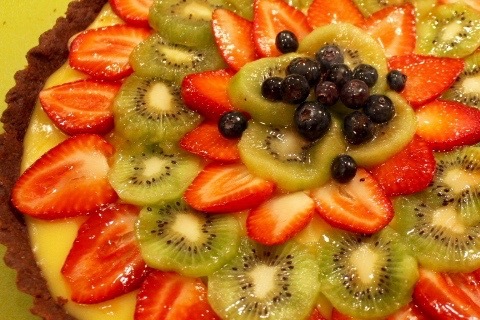 Strawberries and kiwi are a natural affinity with passion fruit and the colors are gorgeous with the yellow curd. Now all I had to do was come up with a recipe. After doing a little research, I found a chocolate dough for my tart in Julia Child’s “Baking With Julia”. One recipe will work for a 9 – 10” fluted tart pan. 2.) Add the cold butter pieces and pulse briefly to form small pea-sized pieces. 3.) With the processor running add the egg yolk and ice water and then pulse until just crumbly. 4.) Place mixture on a cool work surface and in small portions, begin smearing the crumbles with the heel of your hand to bring it together. 5.) Shape into a square and pat it down, wrapping it in saran to chill for at least 30 minutes until firm. Dough can be kept in refrigerator up to 3 days. With the recipe for the dough decided on, I set about looking at techniques for making my curd, and you know whose recipes seem to never fail me? Ina Garten’s. So I took her method for making lemon curd and applied it to my passion fruit curd. The dessert itself is not hard to make, especially once the crust is completed. 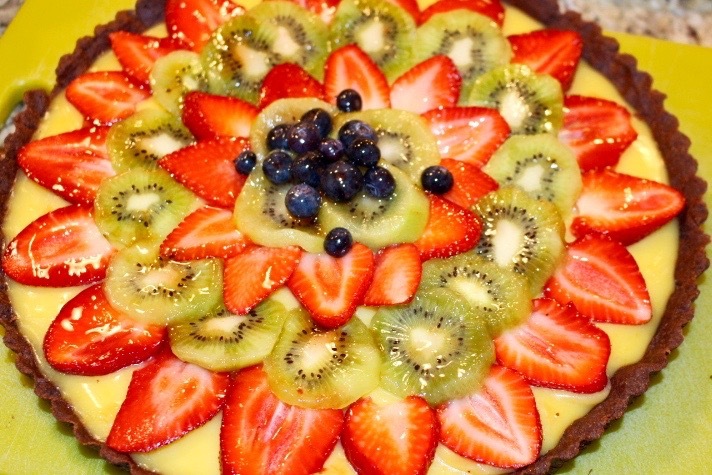 Here are a few tips for making this Chocolate Passion Fruit Tart. 1.) Measure all ingredients and have them ready to go for both the dough and the curd. 2.) Start by cubing the butter and putting it back in the refrigerator to keep it good and cold while getting everything else ready. 3.) Dutch-processed cocoa is alkalized and will give your crust a darker look and deeper flavor. I was unable to find Dutch processed or alkalized cocoa at my local grocer, but did find it at Whole Foods. 4.) For a quick easy method of getting the tart dough into the pan without having to roll it out, get it good a cold in the refrigerator or even freezer and using the large slots of a box grater, grate the dough into the buttered tart pan and press it to the bottom and sides of the pan with your fingers. 5.) Passion fruit pulp can be found in many Latin markets. I used Goya frozen 100% Passion Fruit Pulp. 6.) The ingredients for the curd should be room temperature before you begin making it, so be sure to remove the butter, eggs and passion fruit pulp from the refrigerator in advance. 7.) Since we’re not using a double boiler to cook the curd, and even diligent stirring can leave a few lumps of cooked egg, use a fine mesh strainer to strain the curd once it’s done to remove any lumps or egg that may have formed. 8.) To peel the kiwi, slice the ends off and using a soup spoon insert it into the flesh as close to the peel as possible and scoop it out in one motion. Then slice. 9.) To achieve that glossy finish on the fruit you see in French bakeries, melt jelly and brush it on the fruit prior to serving. Do not use preserves, jam or spreadable fruit for this. You need jelly. I chose strawberry, though color-wise apricot or apple might have been a better option, my grocery store only sells strawberry or grape. 3 Kiwis, peeled and sliced thin into rounds. On a lightly floured cool surface, roll out the chocolate dough to a 12” circle to place in tart pan. Alternatively, chill the dough until it is very firm and grate it into the tart pan using the large wholes of a box grater. Bake for another 15 minutes or so until done, rotating the pan half way through. The tart shell will not be cooked beyond this point. The shell will have a cookie like consistency. Using the paddle attachment of a Kitchen Aid or mixer, cream the butter and sugar. With the mixer running on low, add one egg at a time. Add the passion fruit pulp and salt. There will be small lumps of butter. This is fine as it will melt once you begin heating the curd. In a non-reactive saucepan, gently heat the curd mixture on a low setting, stirring continually with a whisk, making sure the whisk hits the bottom of the pan to prevent the curd from sticking. The butter will begin to melt gradually. Don’t leave unattended as the eggs can curdle. After about 10 minutes the butter will be melted, and the consistency will be creamy and starting to thicken. Keep stirring. If you need to bump up the temperature a little, do it carefully and slowly. The curd is ready when you can scrape it from the back of a spoon with your finger and it leaves a clear trail without drips. The temperature will be 175°. Strain the curd through a fine mesh strainer to remove any lumps from egg that may have cooked at the bottom of your pan. Allow the curd to cool slightly but not set. Pour the curd into your chocolate tart shell and allow to set in the refrigerator. Slice the kiwi and strawberries and arrange starting with strawberries near the edge, then kiwi. Alternating until you are at the center. Top with a few blueberries or blackberries. Melt the strawberry jelly in microwave for 30 seconds or so or on stove top and paint onto fruit topping with a pastry brush to achieve a shiny luster to the fruit. Just before serving, remove the tart from the outside ring by carefully pushing up from underneath the removable bottom. Uneaten portions should be refrigerated.